Woodville School of Arts is hosting a special community information & market day on Sunday, 1 December. The Albion Farm Lotus Gardens, opposite our hall, is in full bloom and will also be open for viewing. The purpose of the community day is for all of us to learn about the local enterprises and community activities happening in our district. Come and meet your community and learn who’s doing what in the Woodville district. Or, if you’d like to let people know about your enterprise, hobby, community group or sports club you can take part by booking a space for as little as $10 to show your wares or set up your soapbox. You can sell fresh produce, arts and crafts. Exhibit information or material, by renting a display board or space. A free community noticeboard will also be available to display local information, so you can post photos, flyers or business cards (max. one A4 page per person). Hot and cold drinks, Devonshire teas, light refreshments and a sausage sizzle available. Donate books, plants or memorabilia to the WSoA stall. Drop-off details: 2-4pm Saturday 16 November and Saturday 23 November. Plants: 2-4pm Saturday 30 November. Entry via southern-most gate of Albion Farm, on Paterson Rd, Woodville. Entry fee: gold coin donation. Lotus blooms on sale. Plus a raffle of lotus inspired artworks. Raffle tickets at Woodville store, & WSoA hall on the day. Woodville is a small and growing agricultural and rural community on the Paterson River, in the Lower Hunter region, Australia. It has an ancient aboriginal heritage and was one of the first areas settled by Europeans in colonial times. Its oldest farm is Albion Farm, established in 1812 – the site of the first free settlement anywhere in mainland Australia outside the Sydney Basin. Our School of Arts has been at the heart of community life since 1877. The legendary champion boxer Les Darcy was born here in 1895, right next door to the hall. We are proud of our quaint old timber building dating back to 1923. when it replaced the first hall. The hall has always been owned by the community and managed by volunteers as a non-profit facility. Our continuing pride in it symbolises our respect for our people and our beautiful and peaceful landscape. It has served many purposes – as a meeting place, flood refuge and war memorial, as a venue for weddings,dances and parties, wakes and educational talks, political rallies, musical performances and children’s play. We have a long and close association with our neighbour, the Iona Public School, and the hall still actively serves the school today. 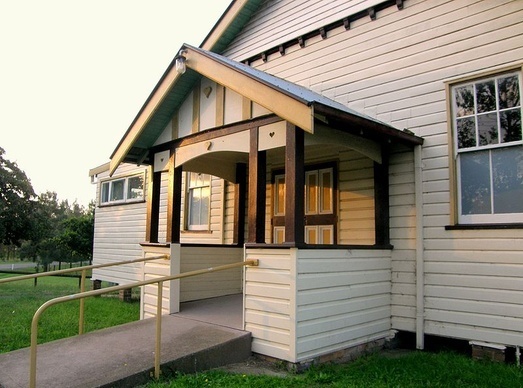 It is one of the few public facilities in its area and one of the few such buildings in NSW still owned and operated by the community itself. We genuinely value your interest and support. We invite you to explore these pages to find out more about us and our rich history. We also warmly invite you to join as a member, wherever you live, and lend your support to this important public asset.